Osmania University OUCET Hall Ticket 2016 is available for Download from aptsmanabadiresults.in and also available at official websites www.ouadmissions.com or www.osmania.ac.in. The entrance test will consist of any 3 or 4 varieties of objective type items such as analogies, classification, matching, comprehension of a research study / experiment / theoretical point of view, etc., with multiple answers besides the usual multiple choice items. 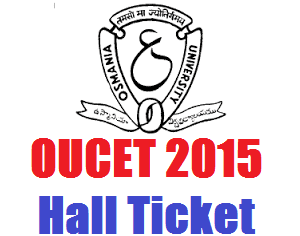 Osmania University OUCET Hall Ticket 2016 is available for Download from aptsmanabadiresults.in and also available at official websites www.ouadmissions.com or www.osmania.ac.in. The Hall Tickets along with entrance schedules and necessary instructions will be made available in OU websites: www.ouadmissions.com or www.osmania.ac.in. The candidates have to download the Hall Tickets and affix a latest passport size photograph (which is exactly similar to the one uploaded in the Online Application) in the space provided and get itself attested. Without the Hall Ticket (with self attested photograph), the candidate is not allowed to appear for entrance test. (multiple choice only) type questions. The entrance tests in all the courses except that of M.P.Ed., will consist of 100 multiple choice objective questions for 100 marks. For M.P.Ed. Course, the entrance test will be of 75 multiple choice objective questions for 75 marks. The remaining 25 marks will be awarded by the Department of Physical Education, Osmania University for the Sports achievements of the candidates during the last three years. A table showing the incentive marks for sports achievements at different levels is given in Annexure-VI. The decision of the Department of Physical Education, OU will be final and binding in awarding the incentive marks for sports achievements. The entrance test will consist of any 3 or 4 varieties of objective type items such as analogies, classification, matching, comprehension of a research study / experiment / theoretical point of view, etc., with multiple answers besides the usual multiple choice items. The items will be framed only from the syllabus of entrance test. The test booklets of entrance tests of OUCET will be of two sets coded as A and B (or X and Y). The candidates have to darken the oval of the respective code of the test booklet given to him/her at the time of entrance test in OMR sheet and also write the same in nominal rolls. The answers for the questions are to be marked on the OPTICAL MARK READER (OMR) answer sheet by DARKENING the respective ovals with a BLACK BALL / BLUE POINT PEN ONLY. To be eligible to seek admission into any course under open and B.C. categories, the candidates must obtain a minimum of 25 percent marks at the respective entrance test. However, for the seats under SC/ST categories, candidates with a minimum of one mark at the respective entrance test are eligible.